Sealed enclosure with two 12 Prime subwoofers. 5/8 medium density fiberboard construction covered with black carpet. 37-3/4"W x 14-3/8"H x 12-1/8D. 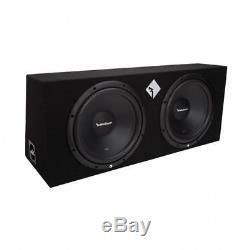 The item "R12X12 ROCKFORD FOSGATE / PRIME R1 DUAL 12 SUBS LOADED IN ROCKFORD BOX NEW" is in sale since Friday, March 30, 2018. This item is in the category "Consumer Electronics\Vehicle Electronics & GPS\Car Audio\Car Subwoofers". The seller is "radioman621" and is located in Birmingham, Alabama. This item can be shipped to United States, Canada, United Kingdom, Denmark, Romania, Slovakia, Bulgaria, Czech republic, Finland, Hungary, Latvia, Lithuania, Malta, Estonia, Australia, Greece, Portugal, Cyprus, Slovenia, Japan, Sweden, South Korea, Indonesia, Taiwan, South africa, Thailand, Belgium, France, Hong Kong, Ireland, Netherlands, Poland, Spain, Italy, Germany, Austria, Bahamas, Israel, Mexico, New Zealand, Philippines, Singapore, Switzerland, Norway, Saudi arabia, Ukraine, United arab emirates, Qatar, Kuwait, Bahrain, Croatia, Malaysia, Brazil, Chile, Colombia, Costa rica, Dominican republic, Panama, Trinidad and tobago, Guatemala, El salvador, Honduras, Jamaica, Viet nam.